Merck Source (2002). ドーランド医学辞典. Retrieved 2005-01-26. Ross, Michael H.; Pawlina, Wojciech (2016)  (English). HISTOLOGY A TEXT AND ATLAS - with Correlated Cell and Molecular Biology (Seventh ed.). Wolters Kluwer. ISBN 978-1-4511-8742-7. NCID BB17984120. OCLC 885230777. ^ Weiss AT, Delcour NM, Meyer A, Klopfleisch R. (2010). “Efficient and Cost-Effective Extraction of Genomic DNA From Formalin-Fixed and Paraffin-Embedded Tissues”. Veterinary Pathology 227 (4): 834–8. doi:10.1177/0300985810380399. PMID 20817894. ^ i-heart-histo.. Histological art. http://i-heart-histo.tumblr.com/. ^ Coyne J. (2012). 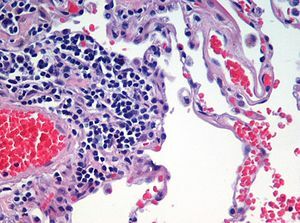 “A squamous cell carcinoma with a Saint Valentine's day message”. Int J Surg Pathol 20 (1): 62. doi:10.1177/1066896911434768. PMID 22287650.